Aiseesoft iPhone Software Pack for Mac consists of Aiseesoft Mac FoneLab, Aiseesoft Mac FoneTrans, Aiseesoft iPhone Ringtone Maker for Mac and Aiseesoft Mac Video Converter Ultimate. 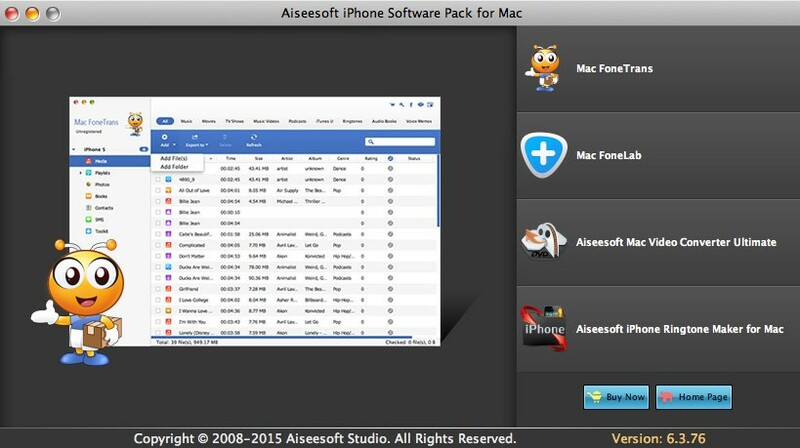 Aiseesoft iPhone Software Pack for Mac consists of all powerful Aiseesoft Mac FoneLab, Aiseesoft Mac FoneTrans, Aiseesoft iPhone Ringtone Maker for Mac and Aiseesoft Mac Video Converter Ultimate. With it, you can rip homemade DVD disc and convert popular video/audio files to iPhone compatible video and audio formats, transfer videos, audios and photos between iPod and Mac without losing anything, and even create iPhone M4R Ringtone from video, audio and DVD sources. What's more, it is highly compatible with the latest device such as iPhone 6/6 Plus, iPad mini 3 and iPad Air 2 and iTunes 12, iOS 8.4. The included Mac Video Converter Ultimate can help users convert all popular video(3GP, 3G2, AVI, DV, DIF, FLV, SWF, F4V, MOD, MJPG, MJPEG, MKV, MPG, MPEG, MPEG-2, VOB, MPEG-4 HD, WMV HD, QuickTime HD, HD TS, etc.) and audio(AAC, AIF, AIFF, CUE, FLAC, M4A, MP3, MP2, APE, OGG, AC3, RA, RAM, AU, WAV, WMA) files to other video/audio formats on Mac. It can also help users convert homemade DVD to video/audio formats. Besides, you can also use this software to download video from online. The Mac FoneLab can help you recover deleted data such as messages, contacts, photos and more files from your iOS device or from your iTunes backup files. The included Mac FoneTrans also enables users to share files between different iOS devcies(iPhone, iPod and iPad). You can transfer files such as photos, videos, contacts between any two iOS device or between computer and your iOS device. The included iPhone Ringtone Maker for Mac allows you to make any time length iPhone ringtone with your own DVD, video and audio sources by defining the start time and end time. 2015-09-06 6.3.76 Support the latest devices such as iPhone 6/6 Plus/5S/5C, iPad mini 3 and iPad Air 2, etc.